← In case you missed it…. Here in the Northeastern United States it is a balmy 7 degrees Fahrenheit. While there is a beautiful blue sky, it is not the kind of day one wishes to venture outside unless absolutely necessary. For a griever, it often doesn’t matter about the weather. It simply takes too much energy to do anything beyond what is required, but there is something about the winter that effects us all and effects a griever a bit more deeply perhaps. It is easy to get comfortable, to use the weather as an excuse/reason to stay home, to not engage. While I do encourage what I call couch days, it is also necessary and healthy to take a break. If you have some energy on any given day and/or are looking for something to occupy your time here are some suggestions as to how to overcome the winter blues – whether for grief or for boredom. 1. Cook something comforting. Maybe a big pan of lasagna or baked macaroni and cheese. Divide into portions and freeze some, but bring a serving or two to someone you know might enjoy it. Or bake cookies and bring them into someone’s office (nurse’s maybe?). Or even learn to create an unusual or gourmet dish just for you. 2. Volunteer. I know. Everybody suggests this. There really are tons of volunteer opportunities out there, but who has the energy to find them? You could call the agency/business of your choice or do an online search for a volunteer clearinghouse (like this one locally). Or you could look into charity knitting or crocheting. Or you could clean something out and donate it – clothes, linens, household items, food. Doing something for someone else really does soothe the soul and it goes a long way towards improving your mood if only for a little while — until the next time you volunteer! 3. Complete a project around the house. What have you been meaning to get to and haven’t? Clean out a closet. Paint a room. Organize those photos. Go through your filing cabinets, junk drawer, spice rack. You get the drift. Accomplishing something you’ve put off will give you a boost to maybe complete other tasks. 4. Plan a trip. It can be across the country or across town. Plan to see something you’ve never seen before. Maybe you create a little staycation for yourself and finally go that landmark in your own town – a museum, historical site, walking tour… Or you look into day-drives to visit somewhere close, but far enough to feel like you’ve been away. Or maybe you plan a proper trip. Companies like Road Scholar cater to your interests. Whatever you choose, plan the whole thing out and then do it! 5. Plan a party. It doesn’t have to be elaborate. Maybe you’ve perfected that new dish you tried for #1 😉 and you want to invite someone or a group of people over. It could be as simple as inviting someone over to have tea and watch Downton Abbey. Or a creative popcorn recipe and a movie. Or it could be a proper dinner party with appetizers and a specialty adult beverage. Or you could plan an elaborate bash. Insert your style into planning whatever appeals to you. 6. Join a group or take a class. Lately I’ve been seeing these wine and painting parties. You pay a fee, get to drink wine and paint a picture. It looks and sounds like fun. Grab your best friend and go enjoy. Or maybe you join a continuing education class at a local college. Or some kind of activity class like yoga or Zumba. Our local library has lecture series and other talks as well as a book club. Look into your local resources for informational gatherings. 7. Learn a craft. Whether you join a group to do this or spend time in front of your computer, learn something new. Maybe you’ve always wanted to learn to knit or crochet or sew or embroider or woodwork or paint or etch or whatever! There are so many things out there to try. Pick one. Gather the materials and try. 8. Write your memoirs. You may not think that anyone would be interested in your life story, but I’m sure your family will be one day if they’re not already interested. It could be a general memoir of your entire life or something more specific about a particular experience. My husband’s grandfather spent quite a bit of time writing the book of his life – complete with photographs – and it is a real treasure. You don’t have to be…ahem…older to write a memoir. Anyone can write one. Just start where you want to start and put pencil to paper (showing my age there!) or type to your heart’s content. You can keep it private or share it with the world. 9. Intentional laziness. Huh? It’s cold outside. You really don’t want to DO anything. Then don’t. But prepare a day to do nothing. Set aside a specific day. Go to the library in advance and check out some books you’ve been meaning to read. (By the way, you can order books you want to read that your library might not have. Do this on line or call and ask them to get it for you.) Or have movies lined up to watch. Or whatever you intend to do while doing nothing. On the day of your laziness, snuggle up, make some top-of-the-line hot cocoa or coffee or a hot toddy, light all those candles you’ve been saving for who knows what (if you’re a candle kind of person), and enjoy a day of intentional laziness. Somehow, planning for a day like this feels a whole lot less guilt- inducing than just lazing around on any old day! I hope this list gives you some ideas about how to help lift yourself out of the winter blues. If you are finding it challenging to get the energy to do anything, please consider counseling. 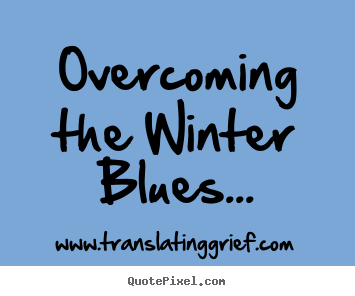 Call me at 1.315.765.6530 or email me at translatinggrief@gmail.com to discuss how I might be able to help you. This entry was posted in Moods and tagged bereavement, bereavement counseling, grief, grief and loss, grieving, winter blues. Bookmark the permalink.